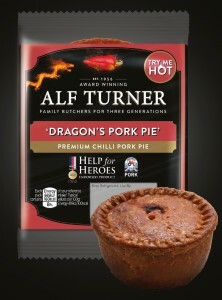 I’ve been a big fan of Alf Turner for a while now and have enjoyed trying some of their previous recipe innovations including the Fury Pork Crackling and the Dragon’s Scotch Egg. It is refreshing when someone is making the classics even better but also reassuring when they are paying close attention to the quality of the ingredients too. 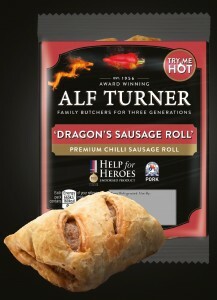 I jumped at the chance to try the Dragon’s Pork Pie and the Dragon’s Sausage Roll! I’m a big fan of sausage rolls and regular readers may remember that I was invited recently to judge a sausage roll competition! The passion exhibited by the entrants was a timely reminder that people are as enthusiastic about sausage rolls as they are about sausages themselves! The pastry was flaky (but not too flaky) and carried the filling perfectly. The filling was really good. High quality pork fired up to the perfect point with the spice. Spicy enough so you knew about it but not spicy enough to cause tears! I’m as fussy about pork pies as I am sausages. I’m a long time fan of the Sarah, Queen of Pork Pies and she sets the bar high with handmade pies with local ingredients. For a long time there has been a gap in the pork pie market for something available nationally which is high quality and a twist on a classic. 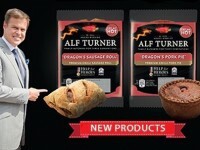 Alf Turner have firmly filled that gap with their Dragon’s Pork Pie. Great pastry surrounding a real filling of innovation. These pies are spicy, not ridiculously so but you certainly taste the spice in them. Just when I though you couldn’t improve on these two great innovations I stuck them in the oven (directions on the packet) and tried them hot! Wow! What a treat! A whole new level of flavours. You need to try these sausage rolls and pies. Find out where you can buy them here.